Which mid-majors could make a Cinderella run to the playoff? As college basketball mid-majors attempt to become the darlings of this year’s March Madness, here are five college football mid-majors who could make a Cinderella run to the playoff. So far, March remains the only month on the calendar to fall in love with Cinderella stories. College football may have added a bracket, but through its first two years the College Football Playoff has been decidedly chock-full of chalk. Still, hopes remains that one day a true underdog from outside of the Power 5 conferences could crack the top four of the rankings and get its shot against the blue bloods in a semifinal. To do so will require the exact right set of circumstances. While the first two years of playoff rankings have yet to produce a serious Group of Five challenger for a playoff berth, they have been instructive in determining what will—or perhaps more accurately, what won’t produce a playoff contender. The right type of schedule is critically important. For a non-Power 5 team to have a serious shot at a playoff berth, it must challenge itself against an elite power conference team. The lack of such a challenge is why 10–0 Houston ranked 19th last season and why 11–0 Marshall ranked 24th in 2014. And of course, a non-Power 5 team must finish the regular season undefeated. Memphis seemed to be on the fringe of the playoff radar after it beat Ole Miss last season, but a Nov. 7 defeat to Navy dropped the Tigers to 21st in the playoff rankings, behind several two-loss Power 5 teams. These factors put the odds firmly against any non-Power 5 team making the playoff, but it wouldn’t be a Cinderella story if it weren’t unlikely. So as Gonzaga, Yale and the other double-digit-seeded mid-majors attempt to become the darlings of this year’s March Madness, here are five college football mid-majors, listed alphabetically, who could make a Cinderella run to the playoff. The Broncos are the one caveat to the rules above. With nonconference matchups against Louisiana-Lafayette, Washington State, Oregon State and BYU, Boise State’s schedule lacks a top-tier Power 5 foe (unless the Cougars make a dark-horse run to a Pac-12 title). However, as one of the original BCS busters, this season won’t be the Broncos’ first flirtation with a high national ranking. While the playoff committee is supposed to consider only the games of the present season, Boise State’s history of winning on the national stage gives it the benefit of the doubt. So if the Broncos can go undefeated and win the Mountain West (no small feat considering a possible conference title game matchup against San Diego State) while Washington State proves to be at least competitive in the Pac-12, that could be enough. And Boise State has the team to hold up its end of the bargain. The offense returns eight starters, including quarterback Brett Rypien (3,353 yards, 20 touchdowns, eight interceptions), running back Jeremy McNichols (1,337 yards, 5.6 yards per carry, 20 touchdowns) and wide receiver Thomas Sperbeck (88 catches, 1,412 yards, eight touchdowns). The defense, however, is full of new faces with six departing starters in addition to coordinator Marcel Yates, who left for Arizona. The Cougars’ lack of conference affiliation gives them greater freedom to build a schedule to fit their goals. Though not as strong as a Power 5 slate, BYU’s 2016 schedule offers several opportunities to prove the Cougars’ worth against quality opponents. 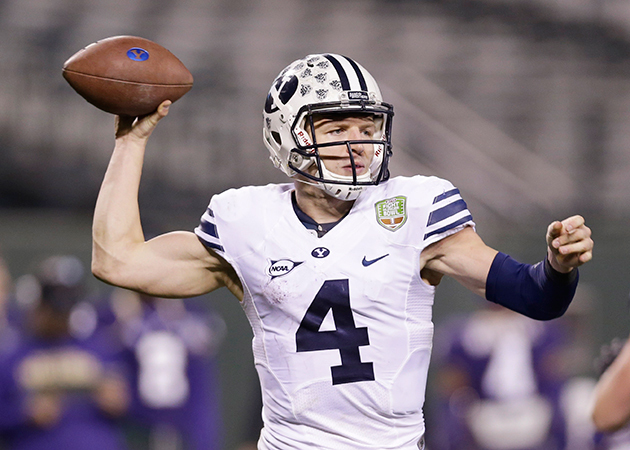 BYU faces teams from the Pac-12, Big 12, SEC and Big Ten. With matchups against Arizona, Utah and UCLA to begin the season, there’s a decent chance the Cougars will play the Pac-12 South champion. An Oct. 14 meeting with Mississippi State presents a winnable test against an SEC foe. And Oct. 8’s trip to Michigan State is the biggest opportunity of all. If the return of quarterback Taysom Hill and the arrival of new head coach Kalani Sitake are enough to guide the Cougars through their daunting slate, it’d be hard for the committee to keep them out of the playoff. The Cougars hardly qualify as true Cinderellas for the playoff as they’re likely to begin the season ranked in the top 20. However, membership in a Group of Five conference could make it difficult for them to rise from their initial ranking to the top four. Fortunately for coach Tom Herman’s squad, it could make a strong statement about its playoff worth just as the season gets underway. Houston kicks off 2016 with a neutral site matchup against Oklahoma, a playoff semifinalist last season expected to contend for a return berth in 2016. A win over the Sooners would instigate talk of the Cougars as playoff contenders. And unlike other Group of Five teams at risk of getting passed over while playing lesser competition after taking on a tough opponent in Week 1, Houston could get credit for handling business in the American if the conference backs up its success from last season. Possible wins at Cincinnati, Navy and Memphis and whomever the Cougars might play in the conference title game could bolster their résumé. Houston also hosts potential ACC contender Louisville in November. The Cougars are riding high into the 2016 season off their Peach Bowl win over Florida State and a successful National Signing Day. Although they lose 11 starters from last year’s breakthrough season, the biggest pieces are back: Herman and star quarterback Greg Ward Jr. That gives Houston the best shot of any Group of Five team to reach the playoff in ’16. The Tigers probably had the most realistic playoff hopes of any Group of Five team last year. Had they gone undefeated after beating Ole Miss and had the Rebels won the SEC, it would have been nearly impossible to leave Memphis out. Consecutive losses to Navy, Houston and Temple and Ole Miss’s defeat to Arkansas ended the Tigers’ playoff hopes last year, but it’s not hard to imagine a similar scenario presenting itself this season. Memphis again takes on Ole Miss, this time in Oxford, and the Rebels again could contend for an SEC title. However, to take down Ole Miss again, not to mention finish off the season unbeaten, the Tigers will have to improve on last season despite losing star quarterback Paxton Lynch and head coach Justin Fuente. Memphis returns only five starters on offense but brings in new head coach Mike Norvell, who oversaw explosive attacks at Arizona State. A regular season finale against Houston could prove pivotal for both teams’ playoff hopes. It’s not an accident that three teams from the American make this list. If any of these three makes the playoff, they will likely have enhanced their résumé by downing the other two (USF and Houston don’t play in the regular season but could meet in the AAC championship game). So, to an extent, each of Houston, Memphis and USF’s playoff hopes rest on the others building on their success from last year to keep the AAC’s stock climbing. For USF to finish in the top four, it’ll also have to upset Florida State on Sept. 24. That’s a tall order, considering the Seminoles are expected to contend for a playoff berth themselves, but it means a Bulls win would likely carry significant weight with the selection committee. South Florida returns more starters (14) than either Houston or Memphis, including Quinton Flowers, who should be one of the AAC’s top passers not named Greg Ward Jr. He’ll be supported by leading rusher Marlon Mack, back after a 1,381-yard season, along with his top two targets. Seven starters also return from a defense that ranked third in the AAC in yards allowed per play. If USF can stun Florida State and jump into championship contention, it wouldn’t be the first time for the program. The Bulls ranked No. 2 in the initial BCS rankings in 2007. That didn’t end well, though; USF went on to drop its next three games and fall out of the rankings.